The years of studying and internships had finally paid off for Lauren Manson, RHIA. In March, when the last radiology center in a multistate network switched on its EHR, Manson knew she had arrived. The 24-year-old couldn’t help celebrating the success of her first EHR implementation project. As an EHR application consultant at Columbus, Ohio-based eInformatics, Manson evaluates HIM workflow and customizes EHR software designed to bring facilities into the electronic age. She works with clients from the project’s start to go-live, using the expertise she gained in college to complete each implementation step. EHR consultant positions such as Manson’s are an emerging opportunity for HIM professionals, one she says she never would have landed if she hadn’t studied in an accredited HIM education program. With the recent federal push toward nationwide EHR implementation, new HIM career opportunities abound. With the right skills, HIM professionals are ideal candidates for positions such as EHR implementation specialists and health data analysts. However, many HIM professionals may be unsure how to transition into these positions. HIM education programs and industry credentials can provide future and current HIM professionals with the tools they need to land emerging job roles, according to Gail Smith, MA, RHIA, CCS-P, HIM program director at the University of Cincinnati and a member of For The Record’s editorial advisory board. 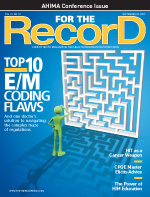 The demand for HIM professionals is expected to double by 2014, according to AHIMA estimates, due in part to the federal American Recovery and Reinvestment Act’s (ARRA) pledge of $19 billion toward nationwide EHR implementation. People are needed to design, implement, and manage EHR systems, roles HIM professionals could fill given the right training, Smith says. Many education programs exist that teach the essentials of EHR implementation and HIM workflow. In fact, there are more than 260 accredited HIM academic programs located in 45 states, with 205 offering HIM associate degrees, 57 sporting HIM baccalaureate programs, and eight featuring master’s degree programs. Students at an accredited, well-respected HIM school reap benefits beyond education. Accredited schools require students to complete several internships that provide hands-on experience in the field. These internships, which often involve EHRs, supply students with the practical experience and connections to land jobs following graduation. Many HIM programs have adapted their content to meet the new demand for technically trained healthcare professionals. The University of Cincinnati recently modified its HIM program to focus more on project management and data analysis training, skills needed for positions such as EHR implementation specialists and health data analysts. Cincinnati is also developing a six-month EHR implementation certificate program in direct response to the ARRA. This online program, which features HIM and IT courses, would give HIM professionals specific training to land jobs implementing and managing EHRs. For new HIM students, earning an HIM associate’s or bachelor’s degree is the best path to a technical healthcare job. But for seasoned workers looking to advance into emerging roles, certificate programs are recommended. That line of study can develop technical- and EHR-specific skills and give students a chance to earn a certificate that looks good on a résumé, Smith says. When searching for an HIM program, Smith says it is important to confirm that the school is accredited by the Commission on Accreditation for Health Informatics and Information Management Education (CAHIIM), which evaluates HIM education programs and offers accreditation status to those that meet specific quality standards. Cincinnati’s HIM program, which has more than 200 students enrolled, has been accredited since its inception in 2005. Accreditation is essential for the program, Smith says, because it shows prospective students that the university offers top-notch HIM education. CAHIIM accreditation is a sign that education programs are up-to-date and can specifically train students to work in emerging careers. “At accredited schools, you have the high-caliber HIM professionals as educators, people who have their finger on the pulse of the latest in the profession,” Smith says. A credential goes beyond a college degree; it is an objective validation that proves a person’s competence to practice in the field. All of the AHIMA’s seven credentials could assist an HIM professional in getting a technology-based HIM position. Once EHRs are implemented, facilities need staff to analyze data and ensure quality. Health data analyst positions are popping up across the healthcare field and are expected to increase as more healthcare organizations implement EHRs, Niederpruem says. A new AHIMA credential was created last year to recognize this growing job role. The certified health data analyst credential demonstrates a competency in health data analytics and should be obtained by HIM professionals looking to transition into that field, Niederpruem says. Ever since she first set foot in an HIM department, Manson knew she wanted to work with EHRs. She feels lucky to have landed in an emerging HIM role straight out of college. Others interested in EHRs should transition to the role now, she says, while demand is high. “I get to use all the skills that I obtained in school but also continue to learn on a daily basis, and I think that just comes with being in an emerging technology,” Manson says. — Chris Dimick is a staff writer at the Journal of AHIMA based in Chicago.